With the holiday season around the corner, we’ll all be hearing a lot about electric razors. It’s such an obvious and easy gift for men, and the technology seems to get better every year. We recently tried out one of the new wet/dry shavers from Panasonic. This electric shaver has a ton of features, starting with the Wet/Dry option. You can Enjoy the convenience of a dry shave or you can use it with foam or gel, in or out of the shower as it’s 100% waterproof. This flexibility is great when you’re giving it as a gift. The Panasonic features a 3-blade cutting system and 30-degree inner blades featuring Nanotech technology to cut the hair at its base. It features a fast, linear motor operating at 14,000 CPM to cut through the thickest of beards. It performed nicely for us. The multi-fit arc foil follows the contours of your face for efficient coverage and maximum comfort. It also features a popup trimmer for grooming mustaches and sideburns and comes with a charging stand and holder. Maintenance is easy as it features unique water shutters that allow water to flow freely throughout the head for easy maintenance. 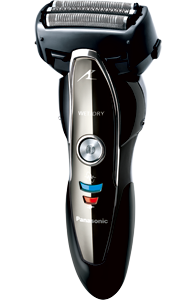 Check it out along with the other men’s shavers at the Panasonic website.